When learning English at Knysna English School, students have the possibility of having an amazing tourism experience. Knysna and the Garden Route have so much to offer! I’m a water baby* so having so much water around me makes me very, very happy! One of my favourite Knysna activities is to go to the Knysna Lagoon. There are so many places to swim and the water is usually warm and always very clear. But swimming is just one of the many activities you can do. Water sports are very popular as well because of the calm waters of the lagoon. Canoeing, kayaking and windsurfing can be participated in and there are many places to hire equipment. In the last few years ‘supping’ has grown in popularity. 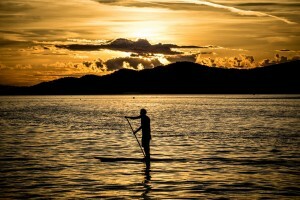 Stand up paddle boarding is a sport that originated in Hawaii and has spread worldwide. One stands on a long board while paddling with a paddle. Knysna is ideal for this sport as, like I said before, the waters are calm and safe. We recommend Tony Cook Adventures and can organise this activity for students. For those who prefer not to be right in the water, Knysna has many, many boating and sailing options. There is a ferry to the idyllic Featherbed Bay, there are restaurant boats, house boats to stay on and also ocean explores that can take students to go whale and dolphin spotting. The possibilities are really endless! So when you book to come and learn English at Knysna English School, make sure to ask about what leisure activities are available. The school will be able to recommend something, to book it for you and sometimes to even get a good discount for you. We are here to ensure that you have the very best English-learning and Knysna tourist experience possible. This entry was posted in Knysna and the Garden Route and tagged Knysna, Knysna English School, the Garden Route. Bookmark the permalink.